Five-spice powder is a seasoning in Chinese cuisine. It incorporates the five basic flavors of Chinese cooking — sweet, sour, bitter, savory, and salty. Roast Pepper corns and Star Anis for two minutes in a dry hot frying pan. Grind the Pepper corns and Star Anis in a mortar, coffee grinder or food-processor until it is a fine powder. Break the Cinnamon stick to small pieces and grind in a coffee grinder or food-processor until it is a fine powder. Mix five spices together, and grind the whole blend once again until you have a smooth and uniform powder. Stored dry, cool and dark in a tight closed jar, your own super Chinese Five Spice Powder will hold for weeks. Asparagus has been prized by epicures since Roman times! The name asparagus comes from the Greek language meaning "sprout" or "shoot" and is a member of the Lily family. Widely cultivated for its tender, succulent, edible shoots, asparagus cultivation began more than 2,000 years ago in the eastern Mediterranean region. Greeks and Romans prized asparagus for its unique flavor, texture and alleged medicinal qualities. They ate it fresh when in season and dried the vegetable for use in winter. One could say asparagus is an international food. With its high tolerance for salt and its preference for sandy soils, wild asparagus grows in such diverse places as England, central Wisconsin, Russia, and Poland. Asparagus is depicted in ancient Egyptian writings. Asparagus has also been grown in Syria and Spain since ancient times.In the 16th Century, asparagus gained popularity in France and England. From there, the early colonists brought it to America. Asparagus is often called the "Food of Kings." King Louis XIV of France was so fond of this delicacy that he ordered special greenhouses built so he could enjoy asparagus all year-round! Asparagus is very versatile. In China, asparagus spears are candied and served as special treats. 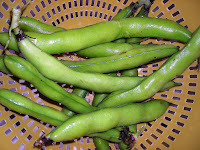 It is widely popular today as a scrumptious, fresh, and healthy vegetable. People throughout Europe, Asia, and North America use fresh asparagus in their favorite cuisine. From the fertile soils of the San Joaquin Delta region to the irrigated Southern California desert, California leads the nation in asparagus production with more than 50,000 metric tons harvested annually. Most of this is marketed as fresh green asparagus. Asparagus was first planted in California during the 1850's. The moderate climate, together with a variety of fertile soil, contributes to the outstanding quality of Asparagus grown in California. To reduce the flow of cocaine into this country by encouraging farmers in Peru to grow food instead of coca, the United States in the early 1990's started to subsidize a year-round Peruvian asparagus industry, and since then American processing plants have closed and hundreds of farmers have gone out of business. One result is that Americans are eating more asparagus, because it is available fresh at all times. But the growth has been in Peruvian asparagus supported by American taxpayers. ''We've created this booming asparagus industry in Peru, resulting in the demise of a century-old industry in America,'' said Alan Schreiber, director of the Washington Asparagus Commission. ''And I've yet to hear anyone from the government tell me with a straight face that it has reduced the amount of cocaine coming into this country.'' . Ten months ago, when it became apparent that there would be no relief provisions for the U.S. asparagus industry in the Peru Free Trade Agreement, the Michigan Asparagus Advisory Board approached Senator Debbie Stabenow(D-Michigan) about some other form of compensation that could be contained in the new Farm Bill. We proposed a Market Loss Program modeled after one the U.S. Apple Industry received for damage resulting from a surge of Chinese imports. Senator Stabenow, who holds a key position on the Senate Ag Committee, agreed to champion the cause and we began working with her staff on crafting language. At the same time, we also began working through the National Asparagus Council to garner support from Senators and Congressmen from all of the asparagus producing states. Over the past 8 months Senator Stabenow has been tireless in her efforts to fight off repeated attempts to strip the bill of the Asparagus Market Loss Program, first through the Senate Ag Committee, then on the Senate Floor and just recently through the House - Senate Conference Committee. I am excited to report that the $15 million Asparagus Market Loss Program will be part of the 2008 Farm Bill. More details will follow as we better understand exactly how the program will be administered. For now I would just like to acknowledge the extraordinary effort of Senator Stabenow in guiding this through on your behalf. I would also like to acknowledge Congressmen Hoekstra's (R-Michigan) strong support on the House side. Buy Local and stay off drugs. It was a fairly uninspiring Farmer’s Market, I kind of expected that-plus I had an attitude that matched the weather, kind of dark and overcast. That record breaking warm weather last week really got me in the mood for some sunshine. At the first booth was a massive mound of the brownish green broccoli I’ve seen in a long time. 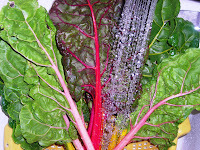 After circling the lot I ended up with some good looking colorful chard and a pound and a quarter of Fava Beans. I really haven’t cooked with Fava’s before, in fact the closest I’ve come to a Fava Bean before this weekend was watching Hanibal Lector, in Silence of the Lambs““ a census worker once tried to test me. I ate his liver with Fava Beans and a nice Chianti. Fufufufufufut.” . I made wilted greens with a couple slices of bacon all chopped up, cooked down, and drizzled with some balsamic. The Fava’s required some labor! I mean you really have to want those little green hearts to be willing to dig that deep. First I shucked the pods and pulled out the seeds. The pods themselves were very cool. They are about 6 inches long and require pulling the strings on at least one, if not both sides of the pod. Inside the seeds sit in a poofy little room with more padding than a Fed Ex glassware package. Once the seeds are all removed you must drop them in boiling water for 3-5 minutes just until the white, paper-like covering is loose. At that point you plunge the entire mess into an ice bath. Peel the covers and you are at the heart of the Fava. 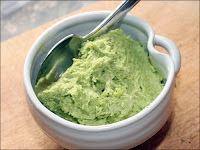 I then pureed the Fava with a tablespoon or so of olive oil, and a little salt and pepper. This I topped on some garlicky bruschetta that I freshly toasted. Amazing, so rich and buttery. Fava Beans have been found in some of the earliest-known human settlements. Most often associated with Mediterranean and Middle-Eastern cuisines, the Chinese have also enjoyed them for more than 5,000 years. 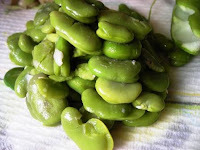 They are also known by an amazing variety of other names: Broad Beans, Windsor Beans, Horse Beans and even Pigeon Beans. The mild climate of the central coast makes the perfect growing condition for these beans. Not everyone loved Fava Beans. Pythagoras told his followers to avoid Fava Beans. 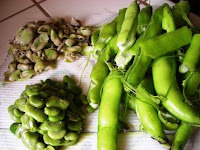 For some people, we now know, fresh fava beans can be poisonous. This fairly common genetically transmitted condition called favism, was recognized only at the turn of this century and has been explained fully just in the last decade. Whether the poisonings were the basis of Pythagoras' pronouncement or not, no one can say for certain. While today's cults seem determined to tell all about their religious beliefs, the Pythagoreans were notoriously close-mouthed. Iamblichus tells of the time a group of Pythagoreans were being pursued by their enemies when they came across a field of favas in bloom. Rather than disobey the master's dictates and flee through the field, they were slaughtered. And when two who were captured were questioned about their beliefs, they refused to answer. The husband chose death and the wife, a Spartan, bit off her tongue and spit it at her captors to avoid spilling the beans. Favas are nutrition superheroes. They are high in fiber and iron, and low in sodium and fat. They have no cholesterol but so much protein, they are called the meat of the poor. 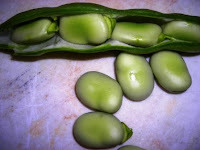 I think these fresh, in season pods would be a great family style dining appetizer served just like Edaname’s in the shell oiled, garlick’d and salted. I found lots of recipes for purees that included butter and heavy cream, that would have been overkill for these already buttery, rich beans. Texturas is a line of products offered by Food Innovations through US Foodservice that are essential for you to be able to incorporate some of our best-known techniques to your kitchen, such as hot gelatins, airs, melon caviar or sperical ravioli. The products that make up the Spherificacion, Gelificacion, Emulsificacion, Espesantes, and Surprises lines are the result of a rigorous process of selection and experimentation. Spherification is a spectacular cooking technique which enables you to prepare recipes that no-one had even imagined before. It consists of the controlled gelification of a liquid which, submerged in a bath, forms spheres. Basic Spherification (which consists of submerging a liquid with Algin in a bath of Calcic) can obtain spheres of different sizes: caviar, eggs, gnocchi, ravioli... the spheres produced can be manipulated, since they are slightly flexible and you can introduce solid elements into the spheres, which will remain in suspension in the liquid, which obtains two or more flavors in a single preparation. Gelatins are one of the most characteristic preparations in classical cuisine, and they have undergone greater evolution in modern cooking. Until a few years ago, they were made mainly with gelatin sheets; starting in 1997, Agar, a product of algae, was introduced and is now commonly used. Food Innovations present Gellan, that allows you to make a rigid, firm gel and Metil, a gelifier extracted from vegetable cellulose. Espesantes: In the kitchen products for thickening sauces, creams, juices and soups have always been used. Starches and flour are the traditional thickeners, but the disadvantage is that a large quantity has to be added, which affects the final taste. With the Espesantes family we present Xantana, a new product which can thicken kitchen preparations using a minimum quantity and without distorting the initial taste characteristics. The lettuce market is soft, as supplies are exceeding demand right now. Warm weather has brought on improved growth rates and demand is near the bottom, resulting in the low market. Availability is good. However there were days of 100 degree heat in the growing regions, last week that may have burnt up the crops. We still have to wait to see what damage there is, so this market could turn around very quickly. There are a few issues to report including some irregular sizing, windburn, and occasional growth crack. There is good green color on most packs of lettuce. Mexico continues to have an abundance of product available and, New Mexico is now reporting the availability of their local crop. The leaf market remains steady. There have been good supplies on all leaf items. Boston had been in short supply basically because shippers did not plant as much this season, supplies are now increasing. We are seeing some shippers pricing green, red and romaine aggressively to move their excess supplies. Romaine weights are ranging from 39 to 44 pounds. There have been some lots showing tip burn, yellow discoloration, and some mechanical damage. Supplies of romaine from Mexico have been sporadic. The broccoli market is stable for the near term. Prices are aggressive, and very promotable, as shippers compete for business. Supplies from all growing regions look to be steady. Broccoli bunched is ranging fro 2 to 4 stalks per bunch. This commodity is showing some branchiness and purple cast. 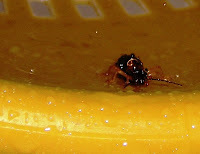 In addition, there has been some yellow discoloration in some lots. We also need to be on the lookout for hollow core. Strong, and steady supplies of broccoli are available from Mexico. The cauliflower market is mostly steady for now; prices will still vary form shipper to shipper. Supplies also vary depending on the shipper and growing region. This commodity is showing occasional off white to yellow color. There have been reports of some lots showing bruising. Weights are averaging ranges of 27 to 32 pounds. Availability out of Mexico is very light right now. The Carrot market continues to remain steady. West Coast supply and quality are adequate on all sizes of Carrots, but starting to tighten up just a bit. Texas carrots are now available. Georgia is still going strong. Quality and supplies are good and the market remains steady. Mexico is busy sending in carrot supplies through Texas. The celery market continues to be very active. Supplies are extremely short, as most shippers begin the day as “sold out”. Prices will continue to be very strong, as seeder issues have taken away approx 40% of the supplies. Booking your orders in advance is suggested. This should continue to be the issue until the Salinas growing season starts in mid June. Strawberries: The past four days of 80 to 90 degree temperatures have caused some minor quality issues with growers. Shippers have had to strip plants to some degree and are having to be very selective as to what they are packing. The biggest problem that has presented it’s self is bronzing due to the heat. Growing areas are now back to cool mornings and mildly warm days, ideal growing conditions. Market remains steady. Raspberries: Production has increased slightly in Watsonville and with the much needed warmer temperatures over the past four days the plants are producing good quality berries and better volume. Quality remains good. Blackberries: Quality remains consistently good. Production in Watsonville has increased and will continue to do so. Some shippers are already lowering prices due to increased production in Santa Maria. Overall production is increasing in all areas Watsonville, Santa Maria and Kingsburg, Quality is good. Blueberries: New crops in California are producing good volume in Delano Ca. and Watsonville is just starting with very small numbers. New crop quality is good with increasing production as we progress into the season. The Carolinas are soon to start. Most shippers will be up to full production by the end of May. Driscoll’s will be in light production this month due to growing region transition. Hot!!! This is a very unstable market for now. . The Idaho storage product is cleaned up for the season. Texas has been experiencing rain this week, limiting supplies there. Imperial Valley California should start packing around the first week of June, but heat has been a problem there. New Mexico should begin the first week of June also. WA pricing continues on its gradual upward trend. Expect general availability to remain tight through September. With Pears, Red Anjous are effectively over and Green Anjous are still expected to last through June. Storage quality is mostly good but it is that time of the season for the potential of 2-3% decay. CA Bartletts will be starting in late July. Truck availability remains decent out of the northwest. Banana pricing is mostly stable and overall quality is good. Contract orders are getting filled but are delayed by 1-2 days as the supply pipeline hasn’t quite caught up from a trucker’s strike and roadblocks in Guatemala that has now been resolved. Vessel schedules should get back to normal beginning next week. With the end of school rapidly approaching, Petite and Quad orders are being adjusted accordingly. Pineapple pricing continues to be firm as demand remains strong partly due to strong retail promotions. Available sizes are petty evenly allocated across all sizes and quality continues to be good. CA Stone Fruit volumes are improving and Plums are now available in limited quantities. Only average demand is weakening markets. Overall quality is good to very good on all types. Beginning-week California Avocado markets on 60’s were softer once again as other sizes remain stable. Smaller-sized fruit has probably hit the bottom and we may see an increase in FOB’s next week. The pricing spread between 48’s and 60’s remains quite wide. There is less Mexican volume now available. CA quality is very good but Mexican-sourced fruit is beginning to have more noticeable shelf life issues. Markets are pretty much stable. CA-sourced product will dry up in the next 2-3 weeks. WA is at full production with good volume. Some product is coming out of ID and MI is getting off the ground. Jersey supplies are decent and Peru remains in the supply mix. Overall quality is good to very good. What little Grapefruit remains available is high priced with quality that can not travel any distance. This deal is effectively over. Valencia markets have strengthened and expected to firm again next week. Quality remains good with a run of sizes available. Navel pricing is strong and steady to slightly firmer. Valencia FOB’s are firm on 88’s and smaller; overall quality is very good and expected cooler weather will maintain good exterior color. Lemon markets are stronger and expected to continue their gradual trend upwards for awhile. Chilean fruit should become available the middle of next month which may help ease the market. However, we do not expect any significant relief in price pressure until September when new crop volume kicks in. Overall quality is ranging from fair to good with good color and juice content--some minimal scarring is being reported. Lime markets are soft as volume improves and supplies are good on all sizes. Overall quality is good to very good with some reports of minimal lighter color. Current demand is just fair. Old crop Chilean Crimsons still have some volume at lower pricing. New crop Flames out of Coachella and Mexico are priced higher but improving supplies are adjusting markets on just about a daily basis. Temps have been extremely hot but cooler weather this weekend will help Flame color. Brix levels and overall quality are very good out of the gate to start the season. Crop size is looking good as well. Cantaloupe markets are mostly steady. Off-shore supplies will linger for about another week. Southern CA, AZ, and TX production areas are all up and running. Heat has helped skew sizing to 9’s and 12’s; 15’s and 18’s are very tight. There is some minimal ground scarring but overall quality is very good. Honeydews are available out of CA, AZ, TX, and Mexico. Off-shore supplies have just about dried up. Markets have been on the weak side but are beginning to show signs of strengthening as extreme desert heat has slowed harvesting and Mexican crossings have recently decreased. Overall supplies should improve next week. Watermelon markets are steady and on the weak side as more fruit enters the supply chain from southern CA and northern Mexican supplies remain solid. Demand is not that strong but has improved for the holiday; FOB’s will ease as new growing areas come online and aggregate production volume strengthens. Quality from all areas is very good. Markets are steady to slightly firmer. Demand has strengthened. Plant City is finishing up and GA production will be more of a factor by the end of the week. Expect supplies to be on the tight side for just a little while longer; pricing will ease once volume kicks in. The Carolinas’ deal will begin next month and NJ will be in field-grown production by the end of June. Quality is fair to good. Markets are slightly firmer as the deal out of mainland Mexico has just about wrapped up and Baja volume is light. Quality out of both areas is ranging from fair to very good. Nogales will be totally finished within the next ten days, Fresno has started its deal with very limited harvesting, and Baja can not cover remaining demand. We expect markets to remain strong after the holiday with production volume slowly improving out of Baja and Fresno. Pricing is firmer as southern FL has finished up earlier than usual, central FL volume is off, and GA has yet to really get off the ground. Pricing will remain elevated until the GA deal has significant volume and may ease down in 10-14 days. Most GA growers should be up and running by the end of next week. Overall Plant City quality is good with some minor amounts of turners and decay being reported—this deal will finish in the next 7-10 day period. GA crown pick quality is very good. Markets have eased this week as eastern demand for holiday loading has finished. Mainland Mexico still has some production but it is plagued by quality issues. The Desert deal out of Coachella will have better volume next week but intense heat may cause quality issues and a premature end to this deal--the outlook is unclear. Bakersfield volume won’t be a significant factor until around the middle of next month. The Nogales deal has finished with field-grown product. Baja volume is limited. The Desert is in crown pick production; there is still strong demand for off-grades that can not be met leaving some Choice orders going unfilled into the holiday weekend. Choice pricing should ease next week as we get past crown picking. Desert quality is ranging from fair to very good. Markets on both Yellow and Zucchini are steady to slightly higher. The Homestead deal has totally wrapped up. Cooler nights last week slowed down production in both FL and GA. Plant City volume is declining--GA will be at peak production by the weekend and quality out of both areas is fair to very good. Wind in GA has created some scarring issues. With Yellow, Nogales will finish up in the next 7-10 days. Light supplies out of central CA (such as Fresno) will not be able to handle the demand pressure as we can expect stronger markets next week. With Zucchini, the Nogales deal will also be finishing up within the next 10 days. Pricing is expected to strengthen next week as well, but not as much as Yellow because there are more CA growing districts that have Zucchini production. Quality is ranging from fair to very good. FOB’s have increased across the board, especially on Rounds on both coasts and Cherries out of the west. Out of FL, XL Rounds and Vine Ripes remain very tight and rain has disrupted harvesting schedules. In the east, volume is declining but quality remains very good. The majority of growers out of Palmetto / Ruskin will finish harvesting by June 1 (some will linger until around the 10th). Quincy now only has a couple of growers, less acreage, and initial harvests are delayed and will begin around June 7-10 creating a supply gap. In the west, Mature Green production has started out of the Desert and will last through mid June; the Central Valley will begin around the middle of next month. Vine Ripe availability out of Nogales is quickly dwindling; Baja production is getting off the ground and Oceanside / Oxnard will start up in early July. Roma volume out of Baja is improving with decent quality. Cherry availability is very tight as there is no decent production sourced out of the west yet and western shippers are solely relying on FL grown product. With regional deals: Charleston is set to begin around the 10th of June and TN in early July. AR will begin its deal early next month with peak volume expected June 20 – July 3; availability of larger-sized Rounds and quality are both expected to be very good. CHEESE: Barrels closed at $2.0300 and 40# blocks at $2.0800. The weekly average for barrels is $2.0205 (+.0605) and blocks, $2.0490 (+.0810). Cheese markets are firm as block and barrel cheese prices at the cash CME market have again closed above $2 for the first time since February. Domestic interest is irregular and international demand is lighter with prices over $2.00 per pound. Current cheddar and other natural American blocks remain tight to short. BUTTER: The butter market closed for the week at $1.50. The weekly average for Grade AA is $1.4880 (+.0310). The cash butter price at the CME continues to strengthen. The cash price has held steady or increased in the past 24 consecutive trading sessions. Churning activity across the country remains seasonally active, although cream supplies for Class IV needs are somewhat less available due to increased usage in other classes, especially for Class II ice cream needs. Domestic demand is mixed as some suppliers indicate that sales have slowed and inventories are building. Others indicate that some buyers are procuring additional volumes and holding them with confidence for future use. Butter continues to be generated for international needs. According to FAS, exports of butter and milkfat for the first quarter of 2008 total 51.7 million pounds, about 9 times more than the same period in 2007. The exports amount to about 11% of the total production for the period. The top five export destinations were: Russia, 15.3 million pounds; Saudi Arabia 6.7 million pounds; Egypt 5.2 million pounds; Morocco 4.2 million pounds; and Australia 2.3 million pounds. These five countries accounted for 65% of the exports over the January - March period. MILK: Nationally, sales into fluid accounts are steady to trending lower, making more milk available to spoonable products, cheese, and butter/powder production. Ice cream and mix accounts in the West are increasing intakes as warmer weather patterns settle into the area. Due to high intakes and plant maintenance, milk loads surplus to California plant capacities are moving east to find processing room. Some receiving plants are running extended schedules to handle all intakes. Arizona and New Mexico dairy herds are maintaining milk production under current cool weather patterns. Milk production in the Pacific Northwest is steady to climbing, both from seasonal effects and additional cows moving into the area from California. Central region processors are receiving higher intakes this week, as bottler sales are steady and milk production is gaining ground. Both the Northeast and Middle Atlantic areas are experiencing higher farm milk production, which is keeping plants busy and sending some milk into tolling arrangements for various products. Production in the Gulf Coast states is steady to declining. The pace on spot cream and condensed skim sales is slowing as soft product producers ratchet up the number of contract loads coming into plants. Increasing transportation costs in the forms of fuel surcharges and trucking premiums are making it more difficult to finalize some spot cream and condensed skim sales. Feed cost concerns are a main topic for many dairy operators. Hay supplies, which as of May 1, 2008 were 44% higher than one year ago on a national basis, are providing little in the way of assurance for most dairy producers. Hay stocks in Oklahoma and Texas account for 80% of the total increase. Dry soil conditions in parts of the West are leading to earlier use of hay stocks by both beef and dairy operations. Cool, wet conditions in the Pacific Northwest have delayed hay harvest by 2 – 3 weeks, and some farmers are taking first cuttings of alfalfa in the Southeast despite plant maturity being less than optimal for quality forage material. EGGS: Retail demand remains fair as we come to the end of the workweek. Wholesale trading activities, limited in volume, are conducted at economic levels which are fully supportive of existing quotations. Acquisition interest is finite in breadth, but expressed at financial postures similar to those of completed exchanges. Supplies are in good balance, and held confidently. Breaking stock, both certified and non-certified and in both Regions, is exchanged and sought above current ranges. The market is steady. The trending-lower of dried whites noted here yesterday has spread to the liquid and frozen variants as well, as sellers attempt to balance their holdings among all value-added products. As such, pricing structures have become more open to negotiation as product throughput becomes more important than economic posture. Beef packers increased harvest levels last week to 719,000 head; the largest harvest since 2003 and did so to cover retail forward sold positions. Additionally, weather throughout much of the country was sunny and warm, igniting retail beef sales. Fill-in business during the first half of this week is expected to be strong and will keep packer inventories balanced, despite large harvest levels. Retailers have found a favorable margin opportunity through the sale of Chuck meat. Korean export activity has also been pushed back 3 or 4 weeks and will not impact the market short term. This is likely the top of the summer market from Strip Loins, Short Loins, Top Butts and PSMO Tenderloins. Round cuts are significantly overvalued. Bottom Round Flats and Knuckles will be sold in the Export at premium money to the domestic market. East coast Retailers have procured Inside Rounds at current market value adding unexpected price and volume strength to the Round complex. We may not see price relief until mid June. Look for a sharp increase in Ground Beef prices in front of Memorial weekend and into mid June. The weekly harvest numbers backed off again as packers continued to see reduced margins. Even with the lower harvest numbers, 2.065MM head, weekly production is still above 2007 levels. The cutout value improved steadily throughout the week, but overall packer margins didn’t improve because the cutout increase did not keep pace with the increases seen on the live hog side. If packer margins remain as is we should expect to see production levels continue a slow decline. Overall wholesale prices improved last week due to solid domestic & export demand as well increased volume being pushed toward deli business. Forecasters expect the market to remain fairly steady with some occasional signs of strength throughout the summer. Last week provided some additional increases in the belly market. At the current price levels buyers should begin to back off. In addition to the potential decrease in demand packers, not wanting to purchase on the open market at the current levels, will being pulling freezer inventory that was secured at a much lower price. As these freezer inventories start to come into play we may see some small downward pressure on the current prices. However, based on current production levels we don’t expect to see any drastic changes in the near term. Loins continued their upward price moves last week in the wake of good retail demand and declining production numbers. Forecasters believe we will start to see some relief or as least a leveling off on both the boneless and bone in loins over the next few weeks. Solid demand helped to push prices last week. Forecasters believe this rally is over and expect the market to remain steady for the short term and decline as we head into June. Both spare ribs and back ribs continue to build momentum heading into the holiday. Stronger demand and declining production should help this market to remain firm for the short term. However, forecasters do see fairly significant declines as we head into June. The trimmings market continues to show signs of strength as we head into the peak hot dog and sausage grilling season. Purchase demand is holding steady even as the prices on both lean and fat trims rose 3 cents and 5 cents respectively last week. Forecasters still see some upside in these markets in May prior to settling back slightly as we head into June. The market was quiet this week. Buyers are attempting to gauge near term demand through retail and foodservice channels. Producers are attempting to bring supply more in line with consumer demand while at the same time fulfilling export orders. For the remainder of the month we should see a fairly balanced market. Heading into June we should see the effects of producer cutbacks as well as increased demand in higher prices. For the time being we are at a plateau from which the market should move higher after the next few weeks. Whole turkeys moved higher on increased demand. At this point no major disruptions are seen heading into the holidays. The season is virtually complete and nearly all product has crossed the border. The season was lower than last year which was one of the highest in recent history. We are still awaiting final number for this current season, but it is still said to be lower than an average year as well. All this means is that inventories are likely to run out sooner and pricing is going to be high and firma for any available product. The Canadian Spring season has not yet started and there seems to be little carry over inventory. Production will hopefully begin in the next 2-3 weeks. Prime and large size tails (5 oz and up) are virtually non-existent and overall pricing is firm. Lobster meat is steady to firm as inventories are lighter than current demand. Fishing has been at its peak for several weeks and will begin to slow down shortly. Over 80% of the season’s 56.73 million pound quota is already landed. Japan has placed their orders as has most of the large “lot buyers”. Pricing continues to be steady to firm. Fishing is done until next season. There is reported to be low inventories in the market and with Alaskan prices up, the market is remaining steady to firm for anything that is available. The season is just getting underway and is not looking very strong at this point. There has been little carryover from the other seasons this year and pricing is steady to firm anything that is available. Scallops are staying about even. Chinese product is still being quoted out on the market very cheaply and is keeping prices soft on all small sizes despite origin. Imports of Swai and Basa catfish from Vietnam are increasing as the popularity of these species grows. International Market: Still seems cautious. Demographics on this product are essential. Some parts of the country cannot get enough of these items and other parts have very little interest. China farmers have some of the same issues the farmers in the US are facing mostly soaring feed prices. Catfish feed mostly consist of soy beans and corn. Some China factories have been hurt financially by the quality procedure timelines that have been extended due to the very thorough inspection process of product entering the country. Short-term prices should be stable with slight movements +/- mostly based on availability and more long-term prices will move upward because of economic pressures. Domestic Market: Seems to be building momentum up after a positive Lent then a very slow post Lent of 3-4 weeks. The Pond Bank prices are moving upward mostly because the weather is heating up and the water temperature is rising which means it is catfish feeding season. Catfish feed, which consist mostly of soy beans and corn, has moved drastically up in prices from 240-260 a ton in 2007 to 375-400 a ton in 2008. Prices should increase steadily over the next five months. Availability could become a factor later on in the year due to the number of farmers that did not re-stock ponds to normal levels, some converted to a row-crop format because of increasing profitability with beans and corn and/or others exited the catfish business for various economic reasons. Look for prices to stay strong and most likely to rise as the grounds price has increased and Cod is in huge demand worldwide. We don’t see any end to this trend in the short term. With the transition from an Olympic style fishery to that of one with individual vessel quotas, the harvest catch rate has decreased compared to 2007. The total quota will likely be caught this year, but it will take longer to achieve it. The vessels in the fishery will harvest flounder when by catch rates are low, and switch to other species when by catch rates are high. The slow rate at which the flounder is produced is keeping prices firm. Canadian production is running small and catch is nearing the quota. Iceland is beginning to catch but they are on the smaller size as well. Look for firm prices on 8-16 oz. fillets and 16-32. On top of this Europe continues to be aggressive in sourcing Cod alternatives. New season is well underway. As of April 28th, 8,353,000 pounds have been landed. This is almost 1 million pounds ahead of last year at the same date. New Zealand cuts Hoki quota 10%. Fisheries Minister Jim Anderton on Tuesday announced catch limits for the coming fishing season of 90,000 tones. He commented that although it was a difficult decision due to the social and economic implications for New Zealanders it was necessary to the ongoing sustainability of New Zealand’s fisheries. Taiwanese production has started. Landings are limited, fish are still small, and prices are starting out more that 10% higher than where South American prices ended. Supply from Australia and New Zealand continues to be limited. Expect prices to continue to firm up. Inventories are good and prices should remain stable. Next fishery in Alaska will be in June or July. We continue to discover the downstream effects of this year’s 28% cut to Bering Sea Pollock quotas in Alaska. In late March Japanese Pollock surimi buyers completed their A-season negotiations with Alaskan producers, agreeing to an average price increase of approximately 40%. For the last few years the Japanese buyers resisted increased surimi prices despite significant global price inflation on other whitefish products, including Pollock fillets. In response Alaskan Pollock producers have each year devoted more of their raw material to fillets and less to surimi, with fillet production surpassing that of surimi for the first time in 2007. This price hike may shuffle that production trend as surimi becomes profitable again and fillet buyers are forced to compete for scarce Pollock raw material. It may also keep upward pressure on Pollock fillet prices at a time when economic worries in the USA have raised the possibility of some relief from the current three to four-year period of seafood price inflation. As Pollock, in fillet or surimi form, becomes either scarce or too expensive for some buyers, they will turn to less expensive substitutes. Pacific hake (or Pacific whiting) provides the most obvious substitute on the west coast. Next to Pollock it is the most abundant whitefish harvest on the west coast and is of a less desirable eating quality, so it sells at a considerable discount to cod or Pollock. A market exists for low-cost H&G and fillet products, but producers mince much of the annual harvest into surimi. Even when Pollock was relatively abundant in recent years, Pacific hake producers sold their entire annual output. But with the 28% Pollock quota cut and subsequent surimi price hike in 2008, there is renewed interest in this year’s Pacific hake fishery, which generally runs from mid-May to mid-June. The Canadian and US governments set quotas jointly through the Pacific Hake Agreement and they agreed on a 2008 quota of 365,000 metric tons (MT), an increase of 11% from last year’s quota. As the season approaches Pacific hake producers report a surge in surimi orders from all markets, including Japan, Korea, Europe, and the USA and even Thailand, itself a major surimi exporting nation. The Japanese orders highlight the tight supply in the market. Japanese buyers had avoided Pacific hake surimi for several years because of the use in its production of egg albumen as a binding agent. Pacific hake flesh contains an enzyme that, unless inhibited, disintegrates the flesh within 30 hours of catch. Harvesters and processors therefore began using bovine blood plasma to keep the flesh intact. Japanese buyers had no problem with bovine blood plasma until Japan banned it after the global scare over bovine spongiform encephalopathy (BSE, or “mad cow disease”) a few years ago. Producers substituted egg albumen, but Japanese surimi buyers rejected the use of egg in their surimi products and effectively withdrew from the Pacific hake market until now. Atlantic: Market is starting to firm. There are continuous reports about production problems, disease and labor issues. Exchange rate between Chilean peso and US dollar is at the highest level seen in many years. Prices are expected to continue up through the balance of 2008. Chum/Keta: The supply of Keta is adequate for market demand. With the reduced forecast for Pink Salmon in the upcoming Alaska season, Keta prices will likely increase as customers switch to this species. Coho: Prices will be firm with tight availability. Catch was only 62% of the forecast for 2007 in Alaska and only 69% of the actual catch in 2006. We should see new season products in September. Sockeye: Another banner year in Bristol Bay of over 30 million fish has given people an opportunity to really promote this fish. Inventory should be adequate with fairly stable pricing. Indications are that the 2008 season should be a strong one with good returns as well. Production in Chile is down significantly and the season is starting to wind down. Look for tight supply and rising prices. Low catch, exchange issues with Chilean peso, and high freight rates are all contributors. Due to high fuel costs, a large percentage of the Asian fleet is stopping operations and prices are increasing sharply. A traditional strong summer is expected. Supplies from China will continue to be tight until this summer. Fish planted after the winter freezing weather will reach a harvestable size around July, and prices should start to drop around then. It will take a number of farming cycles before prices return to anything close to 2007 prices. Sea Trout: Frozen Fillets: Pricing for 2-4s and 4-6s adjusted higher, while 6-8s remained steady but with a full steady undertone. Higher replacement costs have discouraged some importers from buying new supplies. The general undertone is firm. Domestic: Market prices are steady and production is meeting demand. This is a small volume item when compared to other white fish but that should not deter one from offering this fish as a center of the plate alternative to high priced Halibut and Cod. Our market information is that the 8 oz. natural boneless fillets are being well received and are the most likely to compete with other higher priced white fish. Similar to swordfish in that this should be a peak production time in Asia, but landings have been lower than usual. 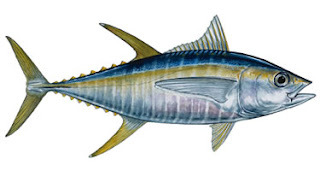 Overall tuna prices, including those for canning and fresh markets, are at all-time highs, and no relief is expected in the short-term. Whiting Frozen Fillets: Pricing levels trended higher on all sizes for both skinless and skin-on fillets. Supplies are tight for an active demand and replacement costs continue to go up. The undertone is firm. Supply is good but we see demand equally good. This has resulted in a stable market price. The major issue in this market is Freight. With a heavy wt. box the shipping costs have had a dramatic impact on price. Packing of new Oysters is beginning now and we should expect supply to say steady. The squid picture in New England has not changed. Landings remain limited and most product is going to a very hungry fresh market. The inshore spring run should be starting now, it has not yet. If it does, much of this production will be frozen whole for domestic and overseas markets, as the size of this squid is usually large. Overseas South America production should begin soon – hopefully sometime in May. China continues to produce limited quantities - though it is still early there. It was a Friday morning and of course I was flipping through commodity reports on the USDA Agricultural Marketing Service (AMS) website when I stumbled across the Popcorn Research and Promotion link. Who could pass up clicking on that? It sure beat the cotton grading and identification page. 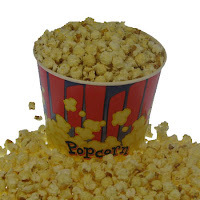 The Popcorn Board is a national commodity promotion and research program. It was formed in April 1998 as an Act of Congress at the request of the popcorn processing industry. 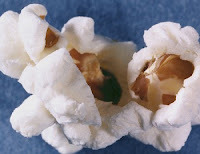 Popcorn was growing in the Americas and providing pleasurable eating for the natives. And, popcorn has remained a favorite for centuries. Archaeologists have uncovered proof that popcorn had been around long before the arrival of the Europeans in the New World. Excavations in the Bat Cave of West Central New Mexico turned up popcorn ears nearly 5,600 years old, according to radio-carbon tests. An 80,000-year-old fossil pollen found 200 feet below Mexico City has been identified as corn pollen. In tombs on the east coast of Peru, researchers uncovered 1,000-year-old grains of popcorn so well preserved they still pop. Other treasures have turned up to validate popcorn's place in the past _ pottery popcorn poppers dating back to pre-Inca cultures in Peru; an old (300 A.D.) funeral urn in Mexico depicting a Maize god with a popcorn decorated headdress. In fact, research has proven that the ancestors of most Native American tribes enjoyed popcorn even before the birth of Christ. And, today popcorn is still considered one of America's favorite snacking pleasures. Toro, the Kobe beef of fish, is the extremely pricey, highly coveted, fattiest part of a bluefin tuna. The species is so prized for its lush belly meat that in the past century, it has been severely overfished. Of equal concern, it also contains among the highest mercury levels of any seafood. But now a farm-raised bluefin called Kindai - the first ever raised in captivity from the egg - offers what some consider a promising new alternative. "It's not just a fish. The story behind the fish is very important, too," said Glenn Sakata, IMP branch manager, who has been importing Kindai since February. "It is the hope of the future. At this point, it's the only hope." After the fish is cut, each section is labeled with a handwritten piece of paper indicating its weight and which restaurant it will go to. The more fat a piece has, the more expensive it is. Top restaurants are willing to pay a dear sum for this exclusive fish - $40 to $70 a pound wholesale. Kinki University Fisheries Laboratory in Wakayama finally succeeded in raising the fish from eggs in pens in the Pacific waters. But only 1.5 percent of the egg population survives to adulthood, according to Mika Higurashi, project leader at IMP for the Kindai. Since the 1970s, the Atlantic population of wild bluefin alone has declined by nearly 90 percent, according to the Monterey Bay Aquarium's Seafood Watch program. In the past, environmental organizations have called for a five-year moratorium on fishing, but to no avail because bluefin is just too valuable. "l love wild bluefin toro, but I finally just had to back off from it," Chef David Kinch said. "With Kindai, nobody has ever raised it from the embryonic stage until now, which could lead to true sustainability." Is Greenpeace Fishing For Something? The National Fisheries Institute is reaching out to food retailers to warn them that it suspects something fishy may be going on with Greenpeace's recently launched efforts to categorize seafood retailers and push an agenda of discouraging the sale of certain species. The NFI, based in McLean, Va., said it objected to some of Greenpeace's requests for information. In its survey, Greenpeace asks retailers about their seafood sourcing policies, including requesting a supplier list and questioning how stores support NGOs. NFI said Greenpeace's red list is "without scientific merit," and includes some of the world's best-managed wild species and most responsibly produced farmed species. The Marine Stewardship Council (MSC) had published a more favorable assessment of the Greenpeace survey in March. "The survey follows similar retailer rankings carried out around Europe," MSC said. "In those surveys, careful seafood sourcing, labeling policies, and public promotion of sustainable seafood all improved retailers' positions in the rankings, and often differentiated themselves from their competitors." NFI noted, however, that three of the species in Greenpeace's red list (Alaska pollock, hoki , and South Georgia toothfish) are certified sustainable by the MSC. See the article at Progressive Grocer. Sold Out-Cooking For Solutions Another Smash Success At Monterey Bay Aquarium! No Chance to get in to this event without pre-planning. I spoke to Jon Kasky and Nancy Rohan of Bird of Paradise Catering from Carmel Valley last week about their booth at this event. This year they were featuring a Tuscan Bean soup, with the theme being under the Tuscan Sun. Over their booth they were decorating with fresh produce and sun flowers grown in their Carmel Valley garden. Incidently you can keep up with Jon and Nancy via their website at Paradisecater.com, or call their office at 831-659-3417 for the recorded message. They just returned from a trip from India, and I'm sure they came back with some new culinary ideas. Saturday I ran into Karim Machi Poissonnier & Evangelist, with Tim O'Shea, Chairman,CEO, and the co-founder of CleanFish. They were in town for the event and we had an opportunity to chat, ever so briefly, about how much better it is to sell a product that you can feel good about. I'm waiting for feedback on how the event went from participants! Sunnyvale, Calif.--If a dealership hopes to flourish in its parts and service endeavors, the two departments need to establish a rapport and work together efficiently. 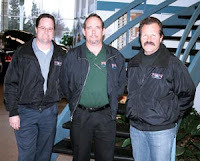 The three-person parts and service management team at Sunnyvale Ford consisting of Parts and Service Director Bruce Isaeff, Parts Manager Michael Peterson, and Service Manager Larry Meola--is well aware of this fact and credit much of their success to a high level of internal communication, cooperation, and seamless interaction. The three must be doing something right because last year they were the No. 1 Ford dealership in their region, outdistancing the 15 other Ford dealers in their zone in both parts sales and service revenues, as well as retail sales volume, Isaeff said. We have all been in this industry for a long time he said. So, we know what's important and what we need to do to be effective. Working together as a team is the first thing. From our counter guys to our techs to our drivers out in the field, we are a very close-knit group. Peterson, 43, has been running the 30,000-square-foot parts department at Sunnyvale Ford for more than five years, he said, and has 22 years of experience in the auto parts industry. He said he supervises 12 employees, including seven countermen, one outside salesman, and four drivers. Isaeff, 46, said he has been the parts and service director at Sunnyvale Ford for the past six years and has 26 years of industry experience. Doing extra things to help the independent repair shops that Sunnyvale Ford sells parts to is a big reason for the dealership's overall success in wholesale, he said. Isaeff said he is also proud of the fact that Sunnyvale Ford is one of only two green certified dealerships in Santa Clara County. “Customers like the fact that we're green”& he said. It was a full dealership effort to get there--we had to come up with a recycling plan and then implement it. We had to switch over to low-energy lighting. And we had to work with our facilities people to make sure we are as environmentally responsible as possible. Sunnyvale Ford is also the No. 1 dealer of Ford hybrid vehicles in the nation, Isaeff said. We sell a ton of Ford Escapes, as well as service them and sell parts for them. The Escape is the only hybrid with an available tax credit right now, so that helps. Isaeff is constantly stressing the importance of customer service to his staff, he said. I tell everyone here that you can never provide good enough service. You can always do more and be better when it comes to serving your customers. I want to make sure that we never forget that. Meola, 58, has been running the 30,000-square-foot, 40-bay service department at Sunnyvale Ford for the past six years and has more than 39 years of experience in the automotive service industry, he said. His department did almost $7 million in business in 2007, he said. Sunnyvale Ford performs a significant amount of fleet work, maintaining and repairing vehicles for entities such as PG&E, San Mateo County, Santa Clara County, and the cities of Santa Clara and Sunnyvale. Sixty percent of the department's workload is customer-generated retail work, half of which is maintenance and service, with the other half consisting of general repair, Meola said. Sunnyvale Ford offers a prepaid service plan that customers can buy when they purchase a new car from the dealership, he said. The prepaid plan is very popular because it allows customers to pay in advance for service at a discounted rate, Meola said. What The Heck Is A Carbon Footprint Anyway? What Do These Recycling Codes Mean?